About Journey’s End – Theatre Reviva! Five British officers are preparing apprehensively for the upcoming attack. Raleigh, an eighteen-year-old officer fresh out of English public school, joins the company of his friend and cricketing hero Captain Stanhope and finds him dramatically changed. Osborne, the 2nd in command, is a middle-aged public school teacher and father figure. Trotter, who has worked his way up through the ranks, has a drily humorous response to the officers’ situation, whilst Hibbert reveals a ‘less than British’ attitude to their predicament. Hailed by George Bernard Shaw as a ‘useful corrective to the romantic conception of war’, the play had its first performance in December 1928, with Laurence Olivier as Stanhope and was an instant West End success. 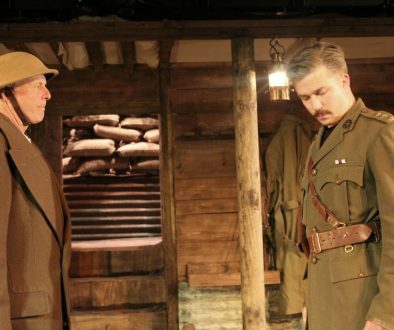 R. C. Sherriff drew on his own experiences as a Captain serving in the East Surrey Regiment in the trenches, and it is this first-hand authenticity, as well as its humanity, that has kept the play a triumph for a full ninety years and a remarkable anti-war classic. This production commemorates the centenary of the end of hostilities in the Great War and recalls the sacrifices of those who never returned, lest we forget.